What is the FORECAST Function? The FORECAST Function is categorized under Statistical functionsFunctionsList of the most important Excel functions for financial analysts. This cheat sheet covers 100s of functions that are critical to know as an Excel analyst. It will calculate or predict a future value using existing values. In financial modelingWhat is Financial ModelingFinancial modeling is performed in Excel to forecast a company's financial performance. Overview of what is financial modeling, how & why to build a model. A 3 statement model links income statement, balance sheet, and cash flow statement. More advanced types of financial models are built for valuation, plannnig, and, the FORECAST function can be useful in calculating the statistical value of a forecast made. 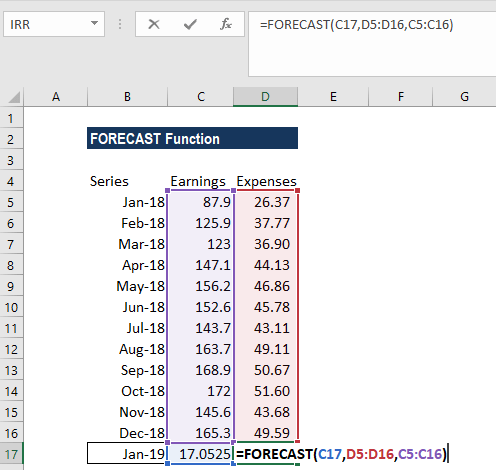 For example, if we know the past earnings and expenses, we can forecast the future amount using the function. 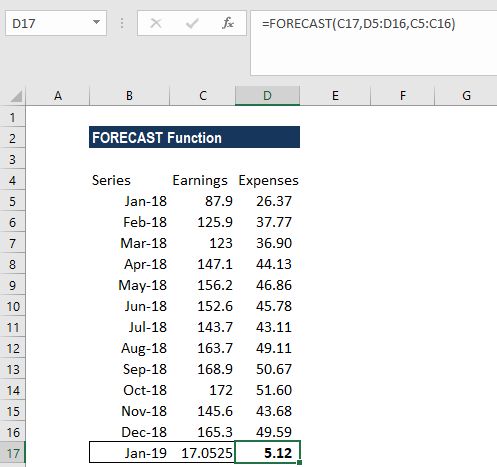 How to use the FORECAST Function in Excel? 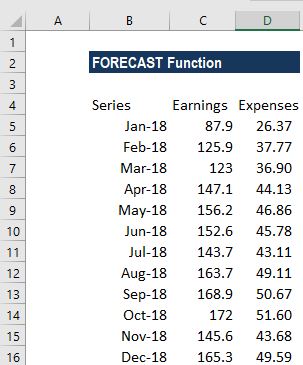 Using earnings data for January 2019, we can predict the expenses for the same month using the FORECAST function. The supplied values known_x’s and the supplied known_y’s arrays have different lengths. One or both of the known_x’s or the known_y’s arrays are empty.